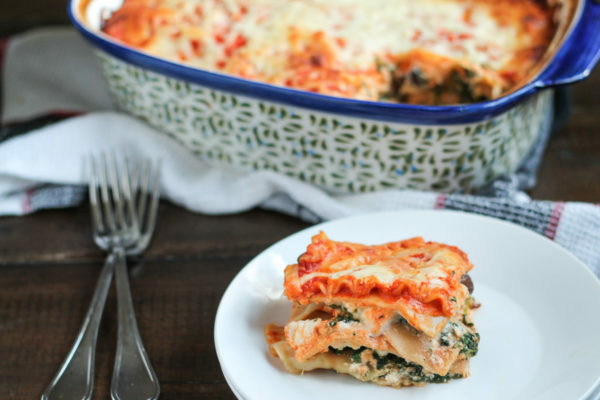 This Chicken and Vegetable Lasagna combines the fresh flavors of summer with a cozy fall meal. It’s perfect for those cool fall nights. I made this on a Sunday night, and we had enough for two more nights of leftovers. Already having a couple of dinners ready as you start the week is such a good feeling; I love being ahead of the game. 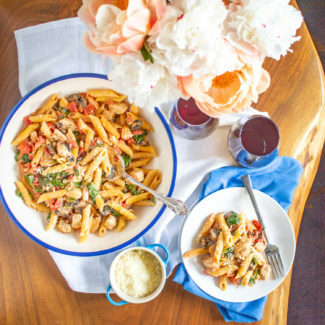 I posted the recipe for the roasted tomato and garlic sauce that I used in this recipe last week. 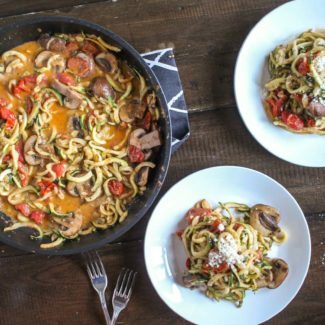 It’s simply made by combining roasted tomatoes and roasted garlic in a blender, and the process of liquefying in the blend makes the sauce creamy, even though it doesn’t have any dairy. 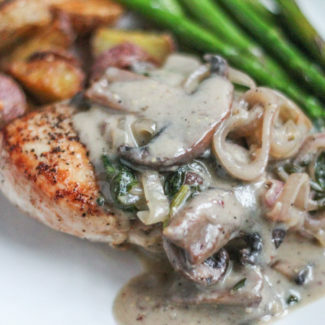 The sauce has a summery flavor and it pulls all of the ingredients in this recipe together. 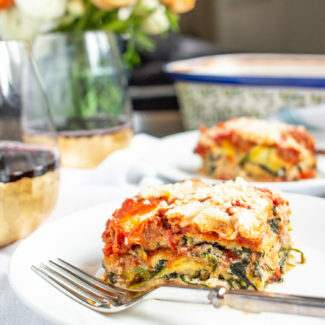 I added all of my favorite veggies to this lasagna – plenty of spinach, mushrooms, and shallots, alongside shredded chicken drowned in the roasted tomato sauce with ricotta. I especially loved how the ricotta and the roasted tomato sauce mixed together. 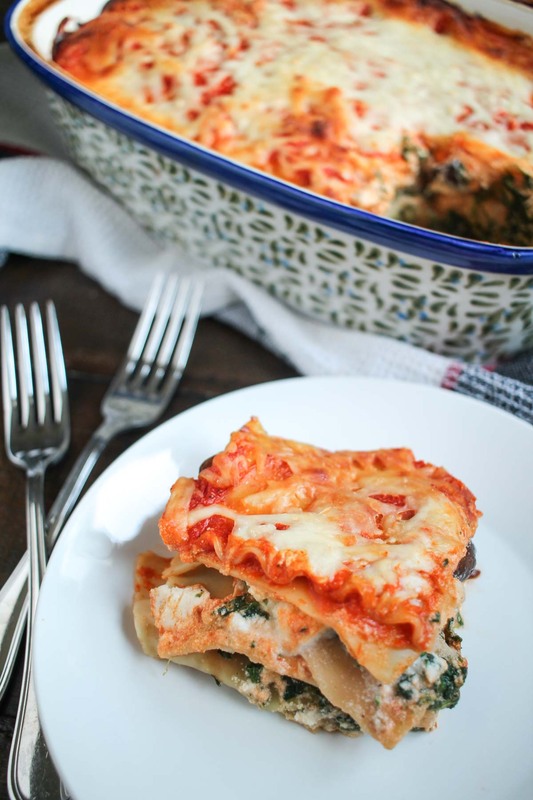 This recipe uses the traditional lasagna sheets that get boiled. In my experience, the no-boil lasagna sheets really need to drown them in sauce for them to cook properly. 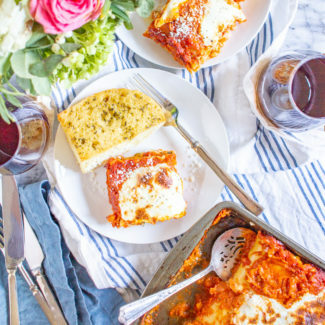 Using lasagna sheets that are boil is foolproof. I made a gif to show all of the layers of the lasagna, it doesn’t show the full assembly process though – just a heads up! Start off by preparing the chicken. Bring 3 cups of the chicken broth to a boil with 1 cup of water. Once boiling, add the chicken breasts. Let boil in the broth for 8-10 minutes until fully cooked. Then set aside and let cool. While the chicken is cooling, saute the mushrooms. First, melt the butter in a skillet over medium heat. Then add the mushrooms. Toss in the butter and sprinkle with salt and pepper. 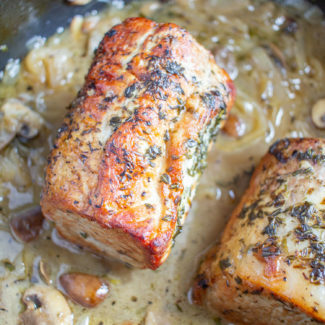 Let the mushrooms cook for 2 minutes, then add 1/4 cup chicken broth. Chop the shallots and add them to the mushrooms, let cook for another 3 minutes, until the shallots are soft and the mushrooms have absorbed the liquid in the pan. Bring a pot of salted water to a boil, and cook the lasagna sheets according to the directions on their packaging. Use this time to shred the chicken, and to squeeze any liquid out of the spinach. Next assemble the lasagna. Pour a thin layer of sauce into the bottom of a casserole dish. Top with a layer of lasanga sheets. 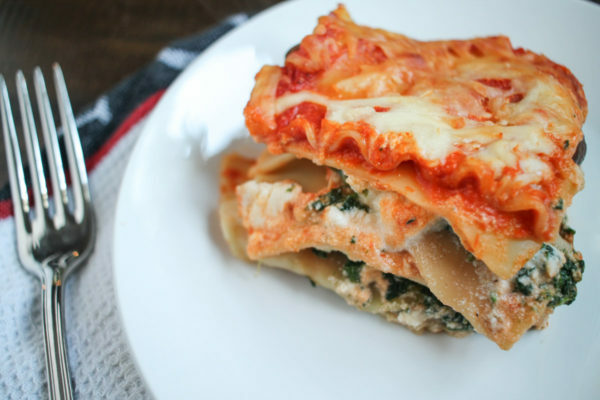 Add a layer of spinach and ricotta on top. Top with another layer of noodles. Spread the chicken out over the noodles and top with a generous amount of the sauce. Really soak the chicken in the sauce so that it won’t dry out. Top with noodles. Spread the mushrooms and shallots over the noodles. Add the remaining spinach on top, and another layer of ricotta. Add a final layer of noodles, top with the remaining sauce, and then the mozzarella. Bake for 50 minutes at 375 degrees.